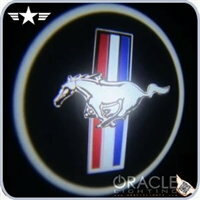 This door light projector displays the PONY logo on the ground when the car is parked and has its doors open. Great for car shows! The light source is a high powered LED so the image is crisp, the housing is small, and it puts out very little heat. No more guessing if you're parked over a puddle or not! The New ORACLE LED door Projectors re-define the "puddle light". Vividly Projects your favorite logo on the floor surface when you open your vehicle's door, hooks right up to your door's wiring. This product is sure to get some attention with added safety. 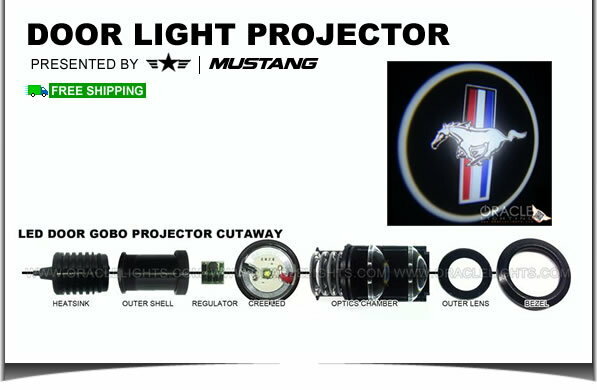 Package includes 2 LED Projectors, and 1 Install tool. A: Its an acronym for "GO Between Optics". It is an image that can be projected when a light source is introduced. In this case the light source is a high powered LED so the image is crisp, the housing is small, and it puts out very little heat. Last edited by NorthAmericanTuning; 04-30-2015 at 11:29 AM.